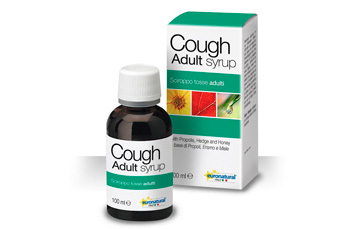 Useful to keep cough under control, this syrup is based on traditional herbal treatments used to cure cough and to reduce irritations in the oro-pharyngeal cavity. Dietary supplement containing Hedge Mustard, Thyme, Mallow herbs, propolis and honey in a balsamic thick syrup status. It has a demulcent and expectorant activity that soothes coughs and helps clear phlegm from upper respiratory tract. With its pleasantly balsamic flavour based on eucalyptol essential oil, it relieves the sore throat and calms the coughing fits. Suitable in case of chesty and dry coughs. The recommended dose is of 5 ml twice a day.